One of the best looking medium SUVs, the KIA Sportage, has been improved for 2014, with no price increase for the base model that remains £17,495. Since its launch in 2010 the KIA Sportage has sold 47,064 in the UK; 20,800 in 2013 alone. 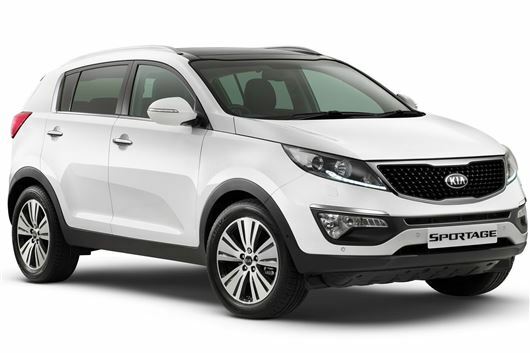 The 2014 Sportage is available to pre-order now and available in showrooms from February. There are enhanced versions of Kia's ‘tiger-nosed' grille across the range, the rear combination lights have evolved, offering better visibility to other road users. LED lighting to further enhance night-time presence and premium appearance has been added to top end models. High end grades are now also fitted with a shark-fin antenna mounted on the rear of the roof and new-style 16-inch, 17-inch or 18-inch alloy wheels are fitted. Importantly, the Sportage still comes as standard with a full-sized spare wheel. KIA's Flex Steer system is now fitted to selected models. This allows the driver to choose between three different levels of power assistance according to preference and where the car is being driven. Comfort mode provides increased help for parking or manoeuvring in tight areas, for example, while Sport lessens the assistance for increased feel and stability at higher speeds. There is also a Normal setting. Inside, a new soft ‘nano' paint finish has been added to the dashboard and centre console and there is now centre console illumination and soft-touch upper door trims. New-style instrumentation includes 4.2-inch TFT LCD supervision cluster mounted between the recessed dials of the newly designed dual-bezel instrument display on selected grades. This displays trip information, outdoor temperature, information about the chosen Flex Steer modes, a gear shift indicator on manual versions and the Parallel Park Assist functionality on models where it is fitted. It also incorporates touch-screen audio system controls and an integrated rear-view camera screen helping owners when reversing or parking. Sat nav versions have a 7-inch colour touch-screen with mapping for 44 European countries, full UK postcode recognition, traffic messaging with a detour function, motorway junction views, lane guidance, speed limit warnings and multi-route planning fitted as standard. All versions now have Trailer Stability Assist to help make towing safer. It works through the Electronic Stability Control system, and continuously monitors vehicle stability, gently applying some front braking force if it detects a potential loss of control. If this is insufficient, gentle all-wheel braking is introduced along with a reduction in engine power until the vehicle and trailer are stabilised. A Tyre Pressure Monitoring System is now standard to alert the driver to any significant under-inflation via an illuminated icon in the instrument cluster. Two new engine choices at the top and bottom have been added to the 16 car line up to further broaden the appeal to customers - an all-wheel drive 2.0 CRDi entry level and the 1.7 CRDi turbodiesel is an option on the top spec two-wheel drive model. All 2.0 litre CRDI models are AWD and now with 134PS or 181PS. Finally, every Sportage comes with KIA's seven-year or 100,000-mile warranty, subject to certain wear and tear conditions. It is fully transferable should the car be sold before the time or mileage limits have been reached. The Sportage is available with Kia's Care-3 and Care-3 Plus servicing package, offering retail customers fixed-cost, inflation-proof servicing for the first three or five years. All work is carried out by trained technicians using genuine Kia replacement parts and specified oils. All packages cover the car, not the owner, so are transferable should the vehicle be sold. If a vehicle with a Care-3 package is sold on then the next owner may upgrade to the five year service package.